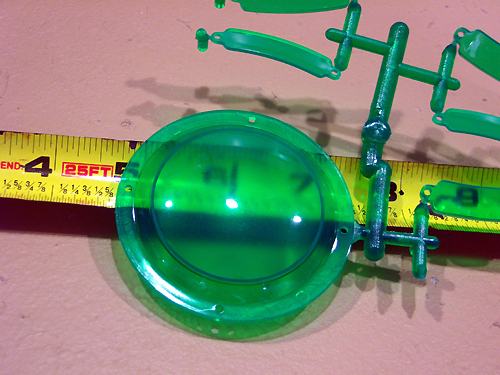 Parts: 21 injection molded styrene (7 in transparent green) . Pegasus Hobbies, a huge hobby store in Southern California, have been branching out into kit production. Image: Landing gear. Detail is a bit soft, but not so bad you can't work with it. Image: Lower saucer - love that iris. They have already built a reputation for simple, inexpensive plastic kits that accurately capture the lines and proportions of their real world subjects. 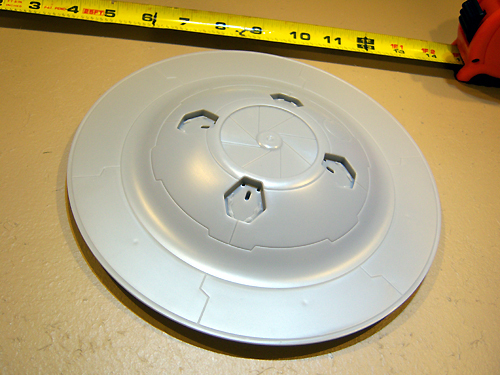 Now they've turned their sights on sci-fi subjects - and one of their first offerings is this 1/72 scale 'Area 51 UFO AE-341.15B' flying saucer. 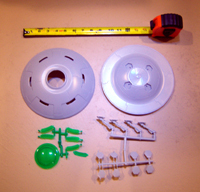 Nestled protectively in plastic bags inside the colorful box are the upper and lower saucer halves plus 19 other parts on two sprues. You get six windows and a top dome molded in translucent green, four landing legs, and 2 sets each of open and closed landing gear bay doors. Molding is first rate; there were no flaws (flash, sink marks or short shots) on my copy -- which I should note was pulled at random from the first shipment we received -- and only the tiniest hint of mold seams. Not that I would expect any on a brand new tool - but other manufacturers, espcially smaller ones, have disappointed in the past. 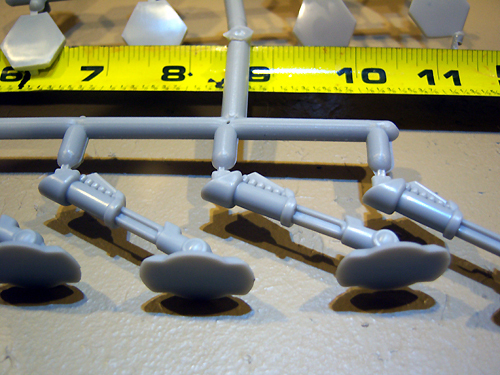 The grey plastic parts are smooth and hard - no pebbly surface texture here, and they'll resist scratching. The green parts are clear enough you can see through them; after a bath of Future you should be able to read a book through them. Instructions are basic - three assembly steps illustrated with exploded diagrams plus a generic paint guide. They are more than adequate to the task. There are no decals, which is fine - none are necessary. Detail is a mix of raised areas and engraving. All of it is a little bit soft on the edges, but the effect looks fine on this subject. You can build this with gear down or gear up (there are separate landing gear bay covers for each option). Test-fitting the parts reveals no real problems. 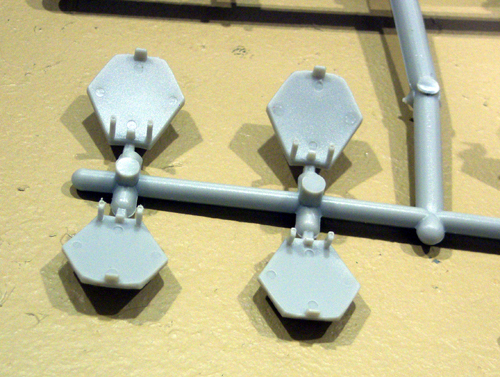 The landing gear and bay covers snap into place quite securely, as do the 'windows' and 'dome'. The windows it into a small ledge on the backside of the upper saucer so there's no gap at all around the outside. 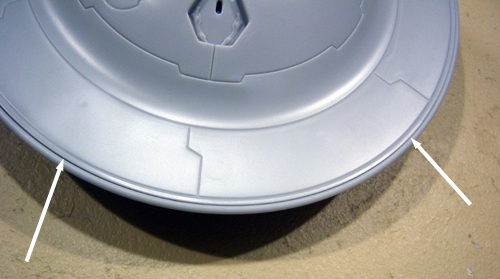 Top and bottom saucer halves fit well, but there's a hairline gap all the way around. 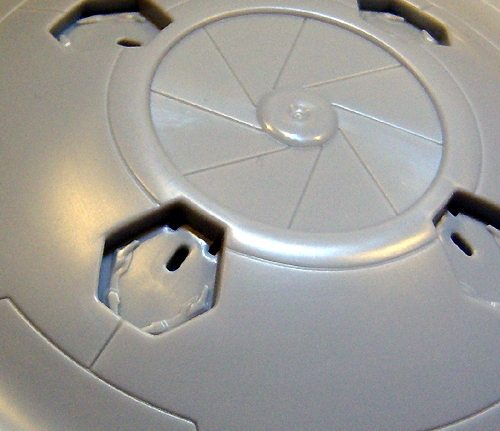 It's so even in width that you could just call it a feature of the design - I'll probably use .010'' styrene strip to fill it, just because I've been conditioned to fill seams by years of IPMS metings. This kit is simple enough my 5 year old could put it together. It's robust enough she could play with it for a long time after - and it's big enough all her Polly Pockets could fit inside for intergalactic adventures. Man, that takes me back - to little green army men and my mother's serving bowls .... but I digress. 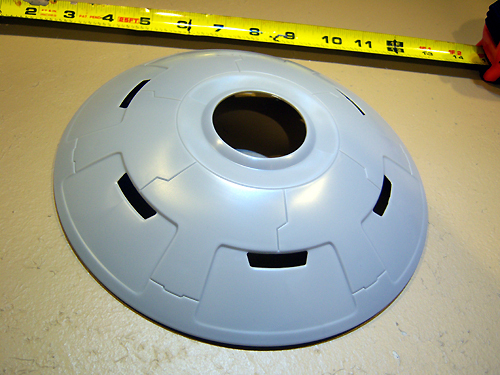 It's also nicely detailed and a good size, and it screams for lighting, for a custom interior, for a diorama. Kewel with a capital "K". And at less than 20 bucks even at full retail, it's affordable. Highly recommended - get one for your kid and two for yourself. Click here to read a build up review of this kit. Many thanks to my wallet (and a clumsy UPS delivery that smashed the box) for providing the review sample. Manufacturers and retailers, interested in getting your wares reviewed and publicized on a site averaging 6000+ readers a day? Contact us!